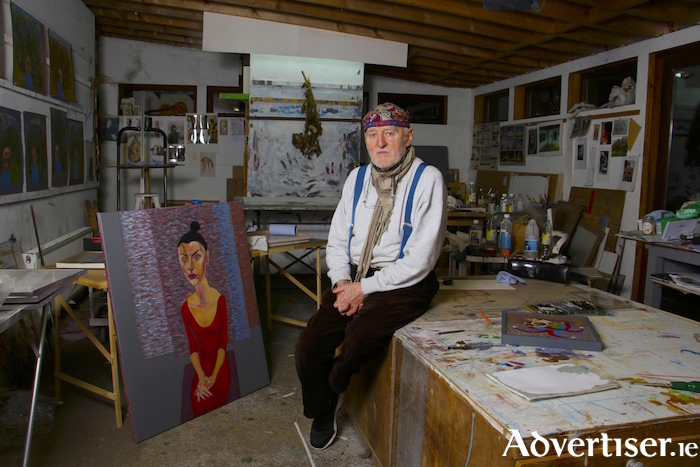 Throughout the six decades of his vibrant and varied artistic career, Brian Bourke has had an abiding love of theatre and actors. He has frequently drawn actors in the flow and moment of rehearsal or performance, and also made them the subject of considered portraits. This rich strand of his work is the focus of a thrilling new exhibition, On The Boards, which opens tomorrow [Friday March 8] in the Town Hall Theatre bar at 5.30pm. The show mostly comprises drawings but also includes paintings, and features such figures as Marcel Marceau, Fionnuala Flanagan, and Mick Lally, scenes from plays by Beckett, and productions by Druid. Brian’s long engagement with theatre began in earnest during his time as a young man in London during the 1950s, as he tells me over a coffee at the House Hotel, where he and his wife, artist Jay Murphy, meet me to talk about the upcoming show. “I didn’t go to much theatre in Dublin before going to London," he says. "I was only in my teens when I moved over there. I do remember going to some of the old music hall type shows in the Olympia with Noel Purcell, they were very funny. Then in London I saw the first production of Waiting For Godot and it was like nothing I had ever seen before and I loved it. The attraction and challenge of drawing dancers was in catching their movements on paper and the same held true of Brian’s sequence depicting mime great Marcel Marceau; “Drawing Marceau was a great set up for me,” he declares. “I had a good easel, and I could stand it offstage as he was performing and the thing about him is he did the exact same thing every night. It was all about movement as he shifted from one character to another but he’d be in the same garb for them all and move in exactly the same places on the stage so it was a doddle for me to draw. I’d lay out the drawings like ‘one, two, three’, and then just move from one to the other. "I like to do that when I am drawing figures anyway; sometimes if I am teaching life drawing I will get two models and have them move around in a circle and the students in the class will say ‘stop’ every so often and the models will stop for 10 seconds. The moving element in drawing is something I have been doing from an early age. On The Boards continues at the Town Hall for the next four weeks, with the artworks being displayed both in the foyer and the bar. Curated by Margaret Nolan, it is a terrific show perfectly suited to its location and is well worth a visit. The exhibition will be officially launched by actor Tara Breathnach.